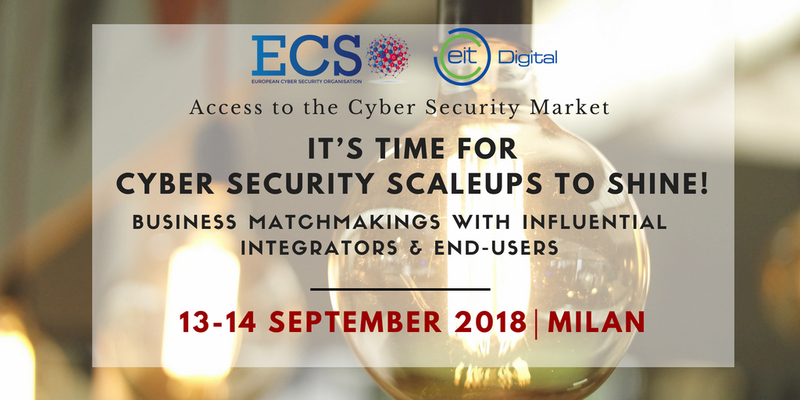 The European Cyber Security Organisation (ECSO) is very pleased to inform about a 3rd edition of ECSO Event to support Cyber Security Scaleups and SMEs, this time organised in cooperation with the European stakeholder EIT-Digital, on the 13-14th of September 2018 in Milan. Last editions of ECSO Startups Event in Tallinn (September, 2017) and Paris (February, 2018) successfully gathered +50 European startups and 20 international investors with several deals closed. ECSO facilitates the meeting between the most influential Integrators & End-users with 25 innovative and promising cyber security scaleups looking for market opportunities. Scaleups’ representatives will have the opportunity to showcase their solutions and in parallel to meet individually integrators and potential customers to pitch their solutions. Besides, B2B meetings will also be organised. 25 scaleups will be selected by ECSO and EIT-Digital on the basis of the most innovative solutions they attempt to introduce to the integrators and end-users. Additionally, the 25 selected scaleups will receive a special training by EIT Digital dedicated team of experts on the 13th of Sept. This will prepare them to be ready for the ‘Pitch Session’ with potential customers on the 14th of Sept.
As for now, EDISON, SIEMENS, VITROCET, ORANGE, NEXTEL, ENGERRING are already confirmed. Please note that the list of the 25 scaleups selected for the Matchmaking with the Integrators & End-Users will be published at the end of July with the Final Agenda. PRE-SELECTION PHASE: 25 scaleups to be selected on the basis of the most innovative solutions they attempt to introduce to the Integrators and End-Users. - The presentation must answer the criteria listed in the “Registration for pre-selection phase” document, below. - The selected 25 Scaleups list for the Matchmaking Session will be published on the 23rd of July. DAY 1 (from 14:00) comprises a special training by EIT Digital dedicated team of experts for the 25 selected scaleups. This will prepare them to be ready for the ‘Pitch Session’ with potential customers. DAY 2 is all about the access to market perspectives. Scaleups representatives will have the opportunity to showcase their solutions and in parallel to meet individually integrators and potential customers to pitch their solutions in 5 min + 3 min Q&A. Besides, B2B meetings will also be organised. Participation of Scaleups: Candidacy by email according to the indications listed in the Invitation attached - Deadline: 15th of July. Participation of Integrators/End-Users: they should register here to attend the event. Please find more details on the event in the attached invitation.